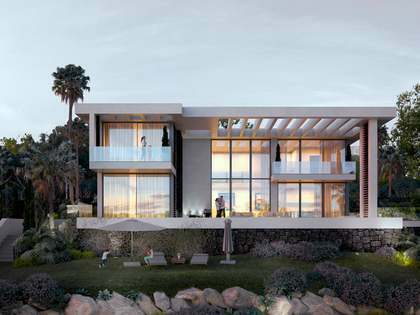 Contemporary residence currently under construction, designed by renowned architectural studio Malaga Marco Sánchez Sánchez. The villa is located in a prime area within La Quinta Golf & Country Club. The Villa offers large open spaces, beautiful gardens, stunning indoor areas including an entertainment and dedicated spa area with a gymnasium, Turkish bath, sauna and indoor pool. Distributed across 3 floors, the villa has been designed to maximise space. Main entrance is on the ground floor leading to the spacious living-dining area with equipped, open kitchen and a guest toilet. From the ground floor we access the fantastic exterior spaces including covered and uncovered terraces, ideal for both dining and enjoying the excellent climate, and an outdoor pool. Heading up to the first floor, here we find the impressive master bedroom with en-suite bathroom and walk-in wardrobe. There are 2 further bedrooms and bathrooms on this floor plus a terrace and gallery from which pleasant views can be enjoyed. The 2 remaining bedrooms are on the ground floor accompanied by 2 bathrooms plus a guest toilet. There is also a lounge, installations room and a cellar hallway. Entertainment and relaxation spaces are in the open basement which is comprised of a games/TV room, gym, Turkish bath and sauna. There is also a garage, water deposit and storage room. A very special property in the exclusive La Quinta Golf & Country Club. Property located within La Quinta Golf & County Club, just a few minutes from Puerto Banús and Marbella.